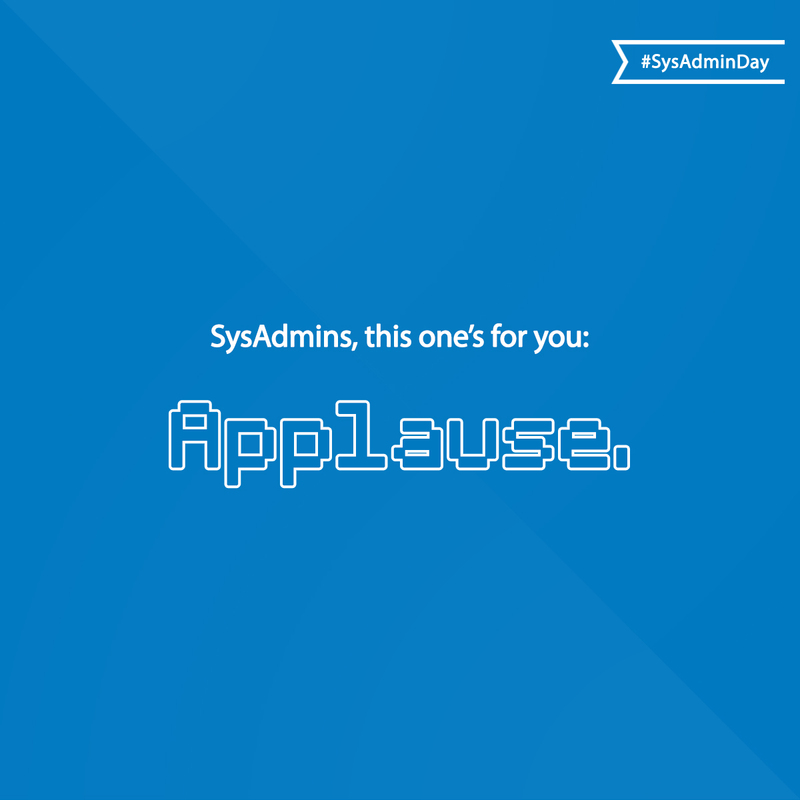 Today is The Day… SysAdmin Appreciation Day. 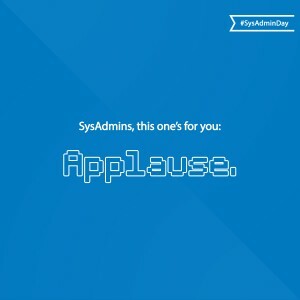 For 364 days a year, most people don’t even think about sysadmins and the great jobs they do, but on the last Friday in July, everyone is supposed to show sysadmins some appreciation for being so awesome. Since so many of those users have no idea what it is sysadmins do or why they are so awesome, we wanted to compile this list to make sure employees know just how great sysadmins truly are. So have a look at this list and then buy your sysadmin a special gift to say thanks! Because without a sysadmin, none of the rest of us could do our jobs! 1. When you need to check your email over your morning coffee, thank a sysadmin for making mobile email available. 2. Did you need to check something on the corporate portal or SharePoint before you started your commute? Thank a sysadmin who runs that platform. 3. If you dial into a phone bridge for a meeting while driving in, thank a sysadmin for making teleconferencing available for you. 4. Once you’ve arrived at the office, thank a sysadmin who keeps that card lock system working smartly. 5. You’re in your office and logging in. That your system logs you in and is ready to be used is thanks to a sysadmin, who manages Active Directory and another who keeps workstations running in top notch form. 6. Launch Outlook, check your email and your schedule, and remember to thank the email sysadmin who keeps that system running 24×7. 7. 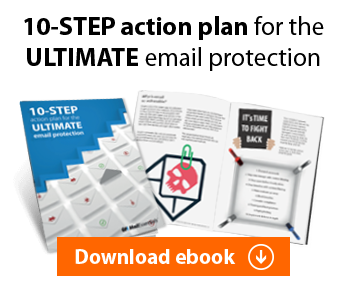 Did you receive an attachment in one of those many emails that you need to print? Thank a sysadmin who makes sure printing ‘just works.’ That same sysadmin is probably also the only one to replace the toner and add paper, even though anyone else in the office could do that if they felt like it. 8. How many different ways can you reach out to your customers? Telephone? Email? Instant Messaging? Skype? Smoke Signals? Every one of those works thanks to a sysadmin. Well, okay, maybe not the smoke signals one. 9. Are you reading this article while at work? Thank a sysadmin who ensures Internet access is available! 10. Leaving early and planning to work from home this evening? Thank a sysadmin for the VPN that makes it possible for you to telecommute after hours. 11. Got plans for this weekend? Try not to rub it in, since your sysadmin is probably either staying up all night, or giving up Saturday, to patch systems, so your work is not disturbed during the week. When was the last time you worked a Saturday so your sysadmin wasn’t inconvenienced during a regular work week? Now let’s consider all those things that happen behind the scenes, which you don’t even see unless something goes wrong. 12. You know how you can get into your data, but no one else can? Security works thanks to a sysadmin. 13. Does your laptop or workstation have Internet access? Thank a sysadmin. 14. Remember that bad link you clicked, even though you knew you shouldn’t, and the world did NOT come to an end because your antivirus software protected you? Thank a sysadmin. 15. And how many of you get great commissions for selling something? That system that lets you track your customers, contact them, and complete the sale that nets you such a great bonus? Built and maintained by a sysadmin. 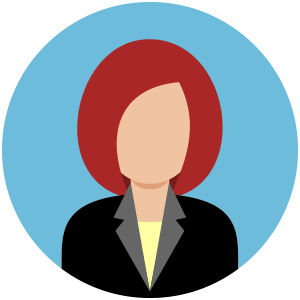 What other roles go above and beyond, as a regular part of the job, more so than a sysadmin? 16. When was the last time you got a call at 2:00AM because something went down? That’s par for the course for a sysadmin. 17. Have you ever come in on a national holiday to replace critical systems or perform maintenance? You better believe a sysadmin is at the office every time you’re not. 18. Have you ever balanced a sysadmin’s checking account, or sold (not bought) Girl Scout Cookies for his kid, or programmed his VCR? But how many times has a sysadmin fixed your personal computer, got that game on your cellphone working, or hooked you up with something for your kid’s video console? How awesome was that? 19. Remember how you are supposed to save copies of all your work up to the network so nothing gets lost? Remember that time you didn’t, your system crashed, and a sysadmin managed to recover the data and save your job? Awesomeness was strong with your sysadmin that day. 20. How many of you have had to drive out to the CEO or President or CVP’s home afterhours to fix something at their house, like their wireless network? More sysadmins than you think have had to do that at some point in their career. 21. How many marketing people, or accounts receivable clerks, or receptionists, or directors, or corporate VPs, or sales people have spent a week on after-hours on-call? Sysadmins don’t sign up in this career field because they want a 9-5 job. They also don’t sign up for this career field because they want to make huge bonus checks for closing big deals with key customers. They sign up for this career because they love technology and they love helping other people. It’s just far too easy for those other people to forget just how much of a sysadmin’s job happens after hours, on weekends and during holidays. On this one day of the year, tell a sysadmin that you think they are great! You certainly have enough reasons to do so. Very good article. I was sysadmin for USDA-ARS until our location closed because of budget cuts. I do like helping people and most people do not realize the things we do behind-the-scenes. I miss it too. I spent several Saturdays making sure the network was working and secure. This piece made me feel better.